If it seems like Mina’s letting them off light, remember this IS the second time they’ve all gotten in trouble for ganging up on other kids. Their parents are maaaaaaaad. 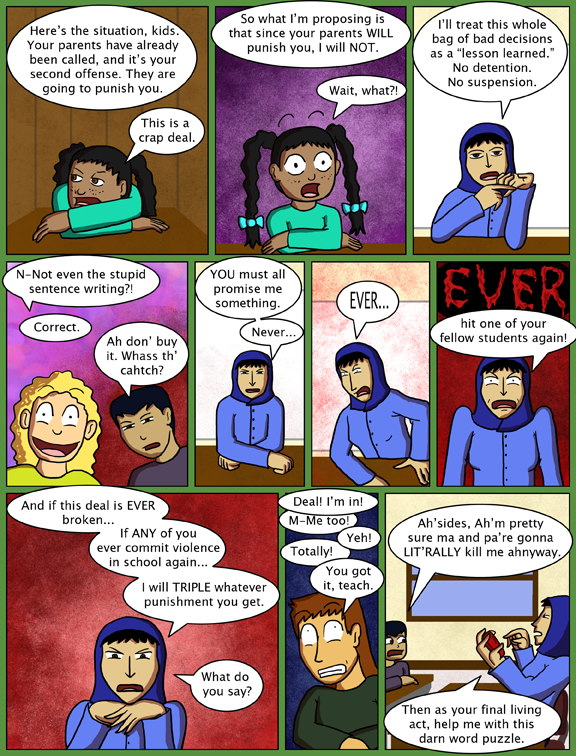 In an earlier draft of this, the conversation happened before recess ended and Mina's deal was that if they all wrote out "I will never hit people again" two hundred times before recess ended they'd be off scot free. They all pulled it off but had severe hand cramps from all the speed-writing. That’s pretty fair all in all, considering what we had waiting when we got home as kids… hooo boy! My poor pop had it the worst– his dad was the principal. So was mine. I went to a different school, but he had worked at that school, so all of the staff knew him. There’s even a pic of me as a baby sitting on the lap of my assistant principal. Needless to say, I stayed pretty straight and narrow during High School. And it doesn’t seem like she’s letting them off lightly; if any of them mess up, she’s made it clear she’s going to come down on the rulebreaker like an avalanche. As I understood, it’s individual, they don’t get any punishment for this one, but if one kid hits another kid again, that kid gets triple the punishment it would normally get for that separate offence. At least thats how I read it. I hope that she means it individually. That’s one of the nastier things that some authority figures do. If ONE misbehaves, the ENTIRE GROUP gets punished. Easier on the one in charge – does not have to decide who did it. And since the group knows that they will all be punished, the group as a whole acts as their own internal police force, making sure NO ONE misbehaves. Sounds good in theory. In practice it’s just mean and lazy. I think she’s a better person than that. Having been victimized by that sort of mentality myself, I can promise you it doesn’t work that way. The primary reason my parents are still alive is that I was too small to beat them bloody for beating on me for things my sibs did I had no control over. Creates a lot of resentment and anger towards the asses who were too damn lazy to bother with figuring out who the real culprits are. Particularly since it doesn’t matter to that sort of mindset whether or not a problematic event was an accident or not. Furthermore, the more kids involved in the mass punishment theory, the worse it is on an individual level. Husband had a babysitter who thought that way, he’s not a better person for it. For him, it also went hand in hand with being force fed spaghettios til he vomited and then being force fed the vomit after. If you think any of this is a good idea for “controlling” children, you should seriously consider getting abuse counseling. In actuality, it feeds nothing but hatred, particularly of authority figures. Your enthusiastic explanation and endorsement literally makes me sick to my stomach and likely stirs up bad memories for anybody else also terrorized by it. To clarify, an abusive authority figure with a small group of children under their thumb will have fewer excuses to beat on, excuse me, punish…everyone simply because there are fewer kids to piss them off. Double that number and the risk increases exponentially, not just because there are more children involved but because there are more personality conflicts likely to create incidents that will piss that person off and give them an excuse to punish everyone. does anyone else get the image of Bill Cosby describing how his Mom yelled at him when he was a kid, about panel 7? Ugh, sentence writing… I got smacked with that several times back in the 80s. I eventually just started writing “I, I, I, I, I, I, (etc), will, will, will, will, (etc)…” which turned the sentences into meaningless gibberish in my head, a multitude of small tasks to be repeated until objective completed. Also wrecked my handwriting, I think. I didn’t think schools still used sentence writing for punishments anymore. They barely teach handwriting any more. They call it “doing lines” at my kids school, but it was the punishment of last resort– if you got a detention (or a JUG in my son’s Jesuit High School) you WISHED hey would hand out something as simple as lines. They should make them write a 1,000 word report (And if they just put the same word 1000 times, they start over). That’s what I did, Hell I even written out of it in cursive…..Dam be that I don’t have great handwriting, dam it be…….. I was a “wrong place, wrong time” kid as well as standing up in big dog fights. So I got it good. Oopsie, my comment below is in reply to this…. Hello, Dave, great comic, by the way! I had been reading it a couple yeare ago but stopped when my old computer broke. I am caught up again after a few days of intensive reading, I am all caught up now. 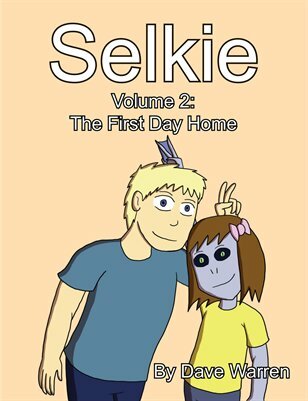 Thanks so much for all your hard work and your interaction with Selkie fans. Your requests for feedback make it all the more enjoyable to read Selkie, knowing you are genuinely interested in your readers’ opinions. Not seriously I hate to even think the amount of work involved in each page but it is amazingly difficult to go through a page every two minutes and now come up to date and have to wait two or three days for the next line. Well no but ongoing story lines are better when they go on. So they can still harass each other as long as they don’t hit each other? That was me when in trouble. Just give me the punishment now, I can take it; don’t make me gamble on my future good behavior. nooooo! the “i caught up with the latest comic” moment!!!!!! Ten bucks says they hit Truck.